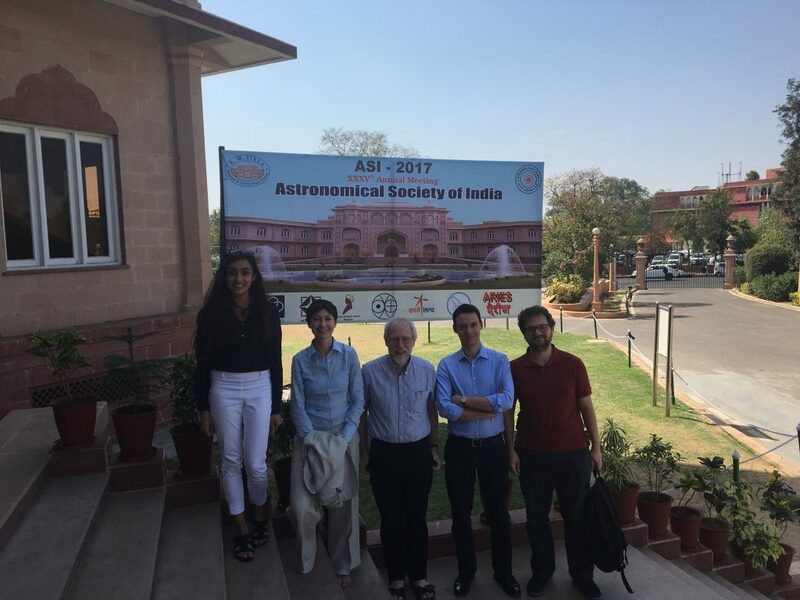 In early March, our team visited the beautiful town of Jaipur in India (often referred to as the “Pink City”) for the Astronomical Society of India (ASI) 2017 conference. We were invited to attend and discuss exoplanet spectroscopy, to develop collaborative research links and to jointly deliver a workshop on spectroscopic data reduction to an audience of Indian students. The organisers of the conference kindly invited Twinkle’s Senior Adviser, Prof Jonathan Tennyson, to present a plenary talk on the topic of “Molecular line lists for the opacity of exoplanets, cool stars and other atmospheres”. We also gave a series of presentations on latest developments in exoplanet spectroscopy and, of course, on the Twinkle space mission. The main focus of our visit was to deliver a workshop on using software developed for the analysis of spectroscopic observations of transiting exoplanets. The hands on session was led by UCL PhD student, Angelos Tsiaras, who published last February the first detection of an atmosphere on the hot super-Earth 55 Cancri e (a planet also called “Janssen”). Angelos, together with colleagues at UCL, designed software to analyse data obtained with the Wide Field Camera 3 (WFC3) of the Hubble Space Telescope (HST), which is currently the most widely used instrument for this purpose. The observations are made by scanning WFC3 very quickly across the star to create a number of spectra. By combining these observations and processing through computer analytic “pipeline” software, the spectral fingerprints of exoplanet atmospheres can be retrieved from the starlight. We provided the participants with the code and with an example data set, as well as a set of instructions on how to analyse the data set. The outcome of the workshop was particularly successful as all the participants were able to use the software while understanding the main steps in processing spectroscopic data from the HST. In addition, many of them managed to extract the final spectrum of the exoplanet, despite the fact that they had no previous experience in analysing such data. Apart from publicising our work, this was an extremely important step in testing the accessibility of our software, as plans to make it publicly available are underway. Discussions with the attendees are leading to new collaborations: students and researchers have expressed interest in using our tools and following-up observations with local observational capabilities. We were very grateful for the warm welcome received at the ASI, and look forward to many years of successful collaboration with the Indian community! This trip was made possible by the support offered by the UCL Global Engagement Office, which aims to foster international research links and collaboration.